Tobie's work in the video game industry has me a lot more aware of various documentaries related to video games, more so the indie creators out there. And I guess the efforts to document the development of Double Fine's Broken Age also had me more familiar with some of the nuances of game development and the kind of people that find themselves trying to make these amazingly creative and inventive games. I had first heard about Indie Game: The Movie because of its Kickstarter project - or at least the last one. But ironically enough I didn't actually back the project for one reason or another. But I did eventually get a copy of the movie through Humble Indie Bundle 7, and then I eventually picked up the special edition of the movie through Steam. I didn't even know that people distributed movies through Steam in this manner. And it was a novel way to get the sort of bonus content that we typically associate with DVDs or whatever. 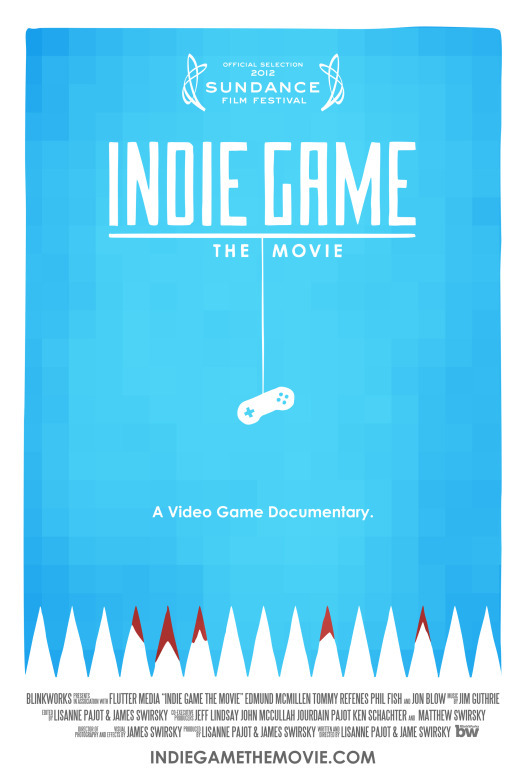 Synopsis: Indie Game: The Movie is a documentary film by James Swirsky and Lisanne Pajot. The movie primarily focuses on three different indie game developments and their respective stories. The games that are the focus of this movie are Jonathan Blow's Braid, Edmund McMillen and Tommy Refenes' game Super Meat Boy, and Phil Fish and Renaud Bédard's Fez. In a way it represents the past (given Braid was already quite the established indie success), the present (as we followed the release of Super Meat Boy on the Xbox Live Arcade), and perhaps the future (given Fez was still in development during the documentary). And going through the different interviews with these different creators, we get a glimpse of part of their creative process and some of the reason why they made the games that they did. And it's interesting to go through their different perspectives on the industry - the only common thread between them being their passion for their games and the desire to see them completed and shared with the world. Blow was dealing with the burden of what to do next - after you have a hit game, what's the next step? How does one meet the expectations of the world at large? Team Meat had a lot of stress to deal with on multiple fronts, both professional and personal. And so much of their future was being tied to this one game. And of course you have Fish, who had a game that initially a lot of people were excited about and yet it just got mired in development hell for 5 years. But passion for their creations is really what ties the movie together. Despite the different reasons each had for creating their game or the struggles they had to go through in order to complete each game. And the time they spent talking about their respective games and how they came up with the core game mechanics and stuff is really the meat and potatoes of this documentary. But it's not all sunshine and roses of course, and this documentary captures a lot of that. Each development team had their share of problems and frustrations both during development and even after release. When you get the special edition of this movie, you'll get to further explore the aftermath (so to speak) of each game given the documentary crew jumps forward a few years to talk to the different creators again. So if anything, the documentary remains very realistic about things. You don't walk away feeling all warm and fuzzy and thinking that anyone can easily get into the market and put out their own game. What the movie ends up stressing more is that it takes a lot of passion and dedication that a game creator needs before starting down this road. The independent game development world is a lonely one and often an expensive one. When you go it alone, you're going to have to face quite a number of challenges before you can even get close to completing your game, what more release it. The original movie on its own is pretty good, but it does sort of leave you feeling left out on the edge given Fez's protracted development cycle. Thus the special edition really becomes a worthwhile investment given all the bonus content provided, which really expanded on the narrative of all the creator stories. Indie Game: The Movie is beautiful in its simplicity, much like many successful indie games out there. It doesn't have big celebrity interviews or popular music tracks and instead it's just focused on getting the stories of these creators and nothing more. And quite frankly, that's all you need. Thus the movie, including the special edition features, gets an awesome 5 interviews with other indie game developers out of a possible 5. Without the special edition bonus features, it's still at least a 4.